Postdoctoral Researcher Eirini Eleni Tsiropoulou is the recipient of the first Susan Frazier Postdoctoral Researcher Travel Award. The annual award, named for ISR's longtime staff member who passed away in 2010, will help ISR postdocs defray travel expenses of presenting research at academic workshops and conferences. 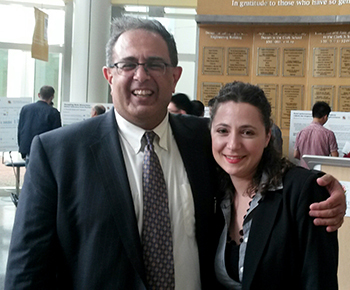 ISR Director Reza Ghodssi announced the award recipient at the institute's "Celebration of ISR Research" reception on May 5. Tsiropoulou will use the award funding to attend a conference this summer. In the fall, she will join the University of New Mexico’s Department of Electrical and Computer Engineering as a tenure-track assistant professor in computer networking with emphasis on the Internet of Things and wireless communications. At Maryland she works with Professor John Baras’s (ECE/ISR) research group. Tsiropoulou earned a Diploma, MBA in techno-economics, and Ph.D. degree in Electrical and Computer Engineering from the National T=echnical University of Athens in 2008, 2010 and 2014 respectively. Before coming to Maryland, she was a Senior Research Associate at the National Technical University of Athens and a visiting scholar at the University of Texas at Dallas. Two of her papers received the Best Paper Award, the first at the IEEE Wireless Communications and Networking Conference (WCNC 2012) in April 2012 and the second at the 7th International Conference on Ad Hoc Networks (ADHOCNETS 2015) in September 2015. Her main research interests lie in the area of wireless heterogeneous networks, with emphasis on optimization and resource allocation, smart data pricing, Internet of Things, game theory, social recommendation and personalization for multimedia, and demand response management in smart grid networks. She has held leading roles in several research and development proposals and projects funded by the European Commission, in the broader area of autonomic wireless networks, optimization in future internet architectures and multimedia content delivery systems.